Strolling along these serene, grassy banks / I bow my head in wondrous, grateful thanks / For these peaceful, still-moments of grace / From life's hard and rancorous footrace / Where hard knocks follow closely on my heels / And the devil slides up offering his cunning deals / I realize there are few who care about my pain / But walking here I appreciate this day's gentle rain / It's not that I don't see the mud below the flowers / Or know that life is quickly ticking away my hours / I see the vultures circling in the clouds overhead / I just choose to focus on this moment's beauty instead. His voice is deep and comforting as he tells Regina's poems of life with all of the loves, dreams, disappointments and triumphs expressed so vividly. So much of what I've experienced in life is communicated in the words of this book. 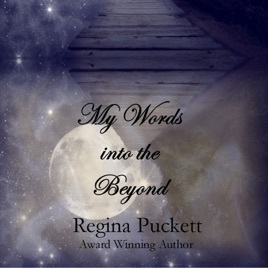 I haven't read poetry for many years, I'm so glad I connected with you on Twitter (@ReginaPucket) and found your writing - so fresh - so true - so inspiring.